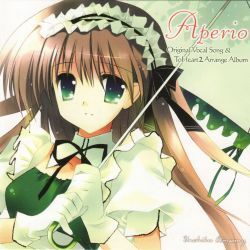 Original Vocal Song & ToHeart2 Arrange Album "Aperio" / Original Vocal Song & ToHeart2 Arrange Album "Aperio" / Original Vocal Song & ToHeart2 Arrange Album "Aperio"
Original Vocal Song & ToHeart2 Arrange Album "Aperio"
Comic Market 70 (C70) release. Tracks 1 and 2 are vocal themes from doujin PC game "Kiba no Kokuin". 3, 4 are original vocal tracks while 5~8 are arranges from ToHeart2.